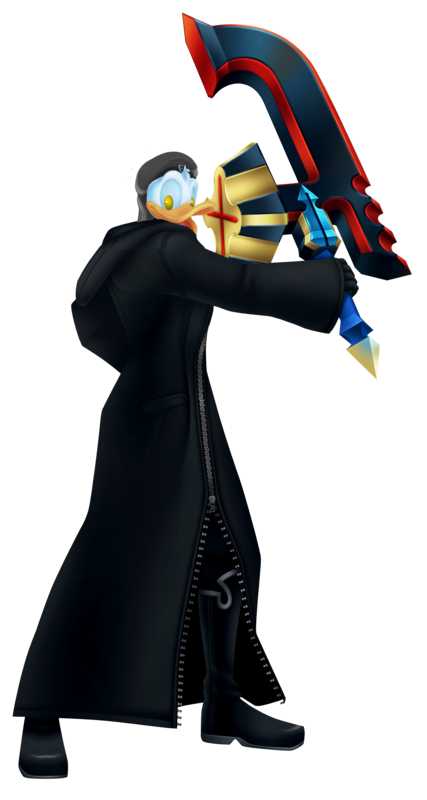 I've seen a lot of edits where Sora is turned into a Seeker of Darkness, but most of them use KH1 and KH2 Sora, so I wanted to use KH3 Sora. I also got the idea of making Donald and Goofy into Xehanort's vessels from this post. Sora, Donald and Goofy had been attacked by the Seekers of Darkness after visiting San Fransokyo and the three of them had been knocked out. Despite Hiro and Baymax's best efforts, Xigbar and Saix held them off while Xehanort implanted shards of his own heart into them. Donald and Goofy succumbed to the darkness as it mutated their bodies, but Sora's mind resisted as Xehanort's heart wrestled with Sora's for control over his body. 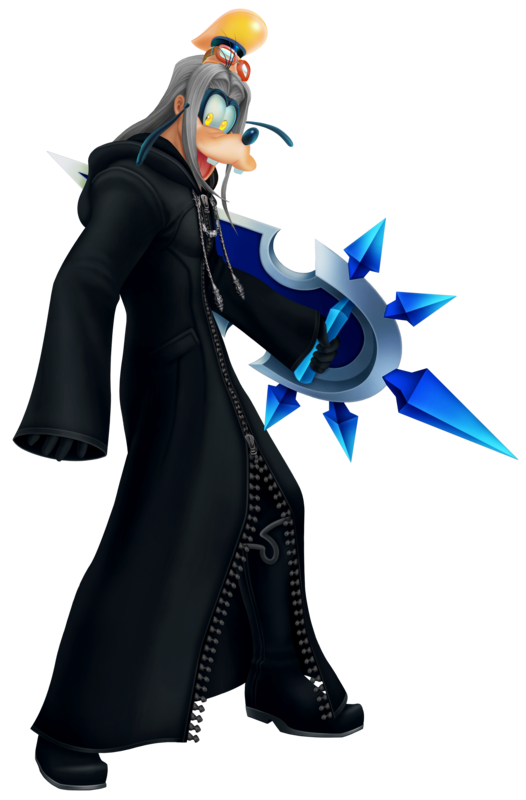 Sora-Xehanort: The former Guardian of Light. Even after becoming a Seeker of Darkness, Sora's heart persists in fighting for control over his own body and expelling Xehanort. Meanwhile, his friends are searching for a way to remove Xehanort's heart. Xehanort's heart had an influence in Donald's body transformation, giving him the body of a warrior while retaining Donald's magical powers. 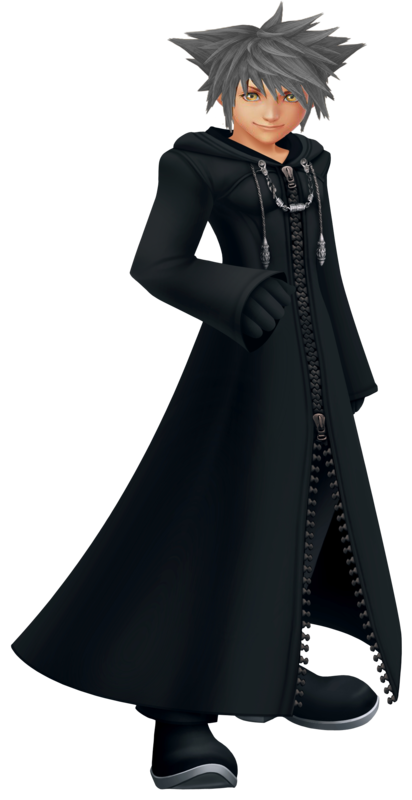 While unconscious, Goofy's body absorbed a shard of Xehanort's heart and his original body was destroyed as Xehanort's influence rebuilt it to resemble Vexen's. *sees Donald* Oh my god! *sees Goofy* OH MY GOD! Well, Goofynot and Donaldnort could just change breed of duck and dog. I mean, Goofy could become an Australian Sheepdog. I am not very knowledgeable in terms of what type of duck breeds that Donald could be. I mean, take this redhead named George from a 1950s Goofy short. George has a dog nose but also what appears to be human ears. So, if Kingdom Hearts actually had animation seen here for all the norts then things might not be as noticeable since everyone is pretty much done in the same cartoon style rather than a mixture of an anime computer animation and anthropomorphic cartoon characters rendered into cartoon. That sounds pretty interesting and it would avoid the style clashes of having anime and Disney characters side by side, but Pirates of the Caribbean and Tron Legacy are still going to stick out like sore thumbs even if the anime characters looked more like cartoon characters. Yeah, that's pretty much true. I mean, Sora kind of stuck out in when he visited Jack Sparrow's world, but he wasn't as much of a sore thumb as Goofy and Donald. Goofy and Donald didn't really seem to clash well in the Pridelands, I mean Goofy stuck out like a sore thumb due to him having a dog head, green hat and pretty much a tortoise body. Pete was no better though. It is probably pretty challenging to come up with a design for characters like Goofy, Donald and Pete that corresponds to the world in which they visit. I mean, if you make all three look like they belong into that world then you might risk the audience not being able to identify them.